And so another luminary exits the world stage. 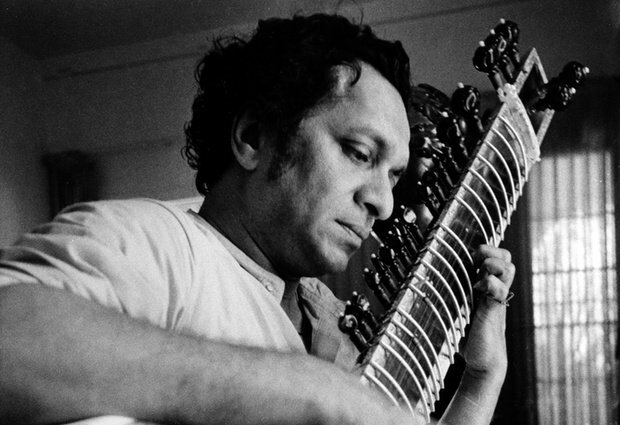 Ravindra Shankar Choudhary, better known as Ravi Shankar, sitar maestro extraordinaire, passed away today at the age of 92. Born in Varanasi on 7 April, 1920, he moved to Paris when he was ten years old, joining his brother, Uday Shankar's world-famous dance troupe. For the next eight years, he would travel with the troupe across Europe, the US and Asia. It was during one such tour that renowned musician Baba Allaudin Khan, the founder of the Maihar gharana, joined the troupe. For a year, young Ravi Shankar learnt the sitar desultorily. Finally, the venerable musician told him candidly that if he wanted to really learn the instrument, he needed to abandon his touring and live and train under him. For the next seven years, young Ravi Shankar underwent a rigorous study of the sitar under Allaudin Khan's tutelage. As a young boy, he had heard Western musicians criticise Indian music as repetitive and monotonous on its own; it was beautiful only when it was heard as a part of dance, they said. Perhaps the idea of introducing Indian music to Western ears, and teaching them to appreciate its intricacies occurred to him even then. Teaching George Harrison to play the sitar, or collaborating with John Coltrane, Yehudi Menuhin, David Crosby, Jean Pierre Rampal, Mstislav Rostropovich, Philip Glass, Andre Previn, Zubin Mehta, et al were all part of this attempt to bring Indian music to the world. Music lovers thronged his world concerts even though, in the beginning, the average listener was often bewildered by the music, mistaking the artistes' tuning their instruments to be the music. They were also unused to the time taken to expound a single Raga. Yet, it was largely through his efforts that a following arose for Indian music, particularly Hindustani classical music. Despite his knowledge of the western world, Pandit Ravi Shankar was himself astounded by the cultural differences, the drugs, the smoking, the noise during his concerts - he often stopped playing until the audience quieted down. There were even times when he picked up his sitar and left. "I was hurt by the idea that our music was treated as a fad," he said. At the Montery Pop Festival in 1967, when legendary guitarist Jimi Hendrix set his guitar on fire, the maestro could barely hold back his shock - 'That was sacrilege," he told The Guardian in 2008. Ironically, even as he was lauded in the West for being the most eloquent spokesman for his country's music, critics in India lambasted him for 'destroying Indian music', and especially for his experimentation with Western sounds. Apart from his intense dedication to Hindustani classical music, Pandit Ravi Shankar composed music for ballets and concertos for the sitar and Western orchestras. a few films, the most notable among them being Satyajit Ray's Apu Trilogy and Richard Attenborough's Gandhi. The latter won him an Oscar nomination. What can one write about such an icon in the world of music? I know very little about Hindustani classical music, though I have always loved the sound of the sitar. My introduction to him came through his film music. I will leave an assessment of his classical career and contributions to people who are better qualified to comment on it, and leave you with a few of his compositions for Hindi films. How would he like to be remembered? In a 1985 interview, he said "If I've accomplished anything these past thirty years, it's that I have been able to open the door to our music in the West." Surely there is more to it than that. His peers and classical music aficionados will no doubt assess his contribution more critically, and one hopes, generously. The world of music is surely the poorer for his passing. Farewell, Pandit Ravi Shankar. May your soul rest in peace. Pt Ravi Shankar, to me have always been been the one who really made that sonic bridge from East to West for the future generations of musicians to travel on.I "discovered"Panditji's music in a Beatles' album, Revolver -the Love You To track..That was some serious playing by George harrison and was wondering whoever influenced him to do this should have been awesome. Though the Sitar-bit in Norwegian wood was familiar, I had mostly relegated it to a passing fad of the Fab Four.His compositions were those those, if you closed your eyes and leaned back, you would actually lose track of time.He flowed.Even the tribute to Concert for George had a 23 minute composition "Arpan" dedicated to George by Panditji, and as Eric Clapton joins in for an impromptu Blues solo at the end which moves Anoushka to well up (who conducts the entire orchestra), you feel yours brimming too.That was the power he had in his music.There won't be another one like him.Ever.Thank you so much for this Anu. Here is the concluding part. Pandit Ravi Shankar has also given us signature tune of Doordarshan [http://youtu.be/Ffh_2NG6tLY] and the Opening Sequence Theme for IX Asiad 1982, New Delhi [http://youtu.be/q3s7CCM9E_g], (to the best of my knowledge) on Raag Jansamhohini. Incidentally Hae Re Ye Woh Din Kyun Na Aaye - Anuradha -http://youtu.be/qhCXMb1NgOs - is also on the same Raag. Here are the theme music of Gandhi http://youtu.be/hJhBG16e80g and the music as the film ends - http://youtu.be/lxRMywOkJmU, which is Panditji's interpretation of a bhajan by an ancient Gujarati poet, Narsinh Mehta, which was so close to Gandhiji for the ideals that it espouses. Ashok, wasn't the DD Signature tune a collaborative effort with Ali Ahmed Hussain Khan Saheb, the Shehnai Maestro? Obviously, I do not have any other access to any "offcial" documentary evidence in support of my statement. Thank you, cinematters. I have listened to his classical expositions because my husband is very interested in music, though I do not have even a tithe of his ear for music. I know what I like, without really knowing the intricacies of the raaga being played. I guess that is how I listen to most music anyway. Thank you for those links, Ashokji. The Doordarshan tune is very familiar (it moaned enough during my childhood), but I hadn't realised that RS had composed it. 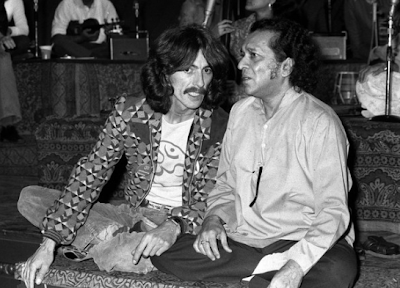 Long before George Harrison discovered Ravi Shankar a very great American musician was already influenced by him. It's a sad thing that jazz a much more intellectually sophisticated music form compared to rock has now fallen by the wayside even in the US. John Coltrane was influenced by Ravi Shankar and started using Indian modes in his music as far back as 1959. He even named his son Ravi after Ravi Shankar. Coltrane's use of the the same free metre as in the Indian alaap can be heard here.. The drone of the tanpura is elaborated upon by the bass lines played beautifully by Jimmy Garrison and then Coltrane enters with the saxophone. I think this is one of Coltrane's ground breaking compositions. Ashok-ji about Janasamohini in the Anuradha song there is one note that is used which is not in the Janasamohini scale. Thanks for the post Anu. Hai re wo din is at the top of my all time favorite list. Mr Vaishnav is right - it is raga Janasammohini. I have only now become aware that Ravi Shankar's first choice for a Sitar guru was Enayat Khan, Vilayat Khan's father. Something happened and he landed up with Allauddin Khan instead. I think it was good for us music lovers, as it gave us two legends with contrasting styles - it wouldn't have been so interesting if both played in the same manner. Rivalry between the two was the stuff of gossip when both were alive. It was good to see Vilayat's son pay homage to Ravi Shankar on DD yesterday. Thanks for the links, Subodh. The last piece was really nice. I'm lying here sick with fever, and having the strains of the sitar in the background is very pleasant to hear. I didn't know that Ravi Shankar's first choice for guru was Enayat Khan... RS came rather late to the instrument, though.